Exactly 160 years ago, in September 1854, British, French and Turkish allied forces landed on the Crimean coast and soon laid siege to the city and port of Sevastopol. 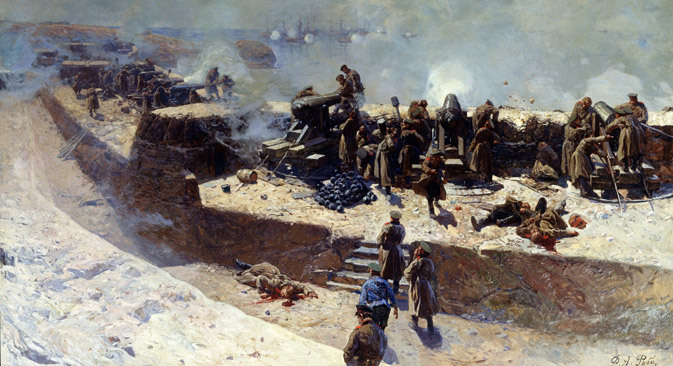 The siege of Sevastopol was not only a confrontation between the Russian army and the Anglo-French coalition, but also a meeting of different cultures. If the Russians and the allied forces were enemies on the battlefield, in bivouacs, during periods of quiet, the two sides engaged in a lively exchange. The balaclava, the raglan sleeve, the cardigan, cigarettes, and war reporting – these are all legacies of the Crimean war. The Crimean War became the first conflict in which Russia was openly opposed to Britain, which had formed a coalition together with France and Turkey. These countries were enemies in the international arena, but there were people on the battlefield, not just soldiers but also officers, who did not consider the war to be reason enough to abandon politeness and civility. Russian officers spoke English and French and, in intervals between fighting, could have a civil conversation with those who would become their enemy again the following day. After the bombardment of Odessa by an Anglo-French squadron, the British frigate HMS Tiger, which had been left behind to take part in the city's blockade, ran aground in thick fog near the entry to the port. Its crew of 225 officers and sailors were taken prisoner and, at first, held in Odessa before the Russian emperor, Tsar Nicholas I, ordered their release. The captives were kept in very good conditions and received constant attention and care from the local population, which they reported in letters home: "Once an elderly Russian officer came to us under a flag of truce. He bowed to a group of English soldiers, offering them snuff. Having drunk the rum he had been offered in return, he told the English officer: 'Russians like the English very much. We would never have been fighting with you. But such is God's will.'" However, if officers behaved as gentlemen, soldiers could not always be described as the epitome of gallantry and high morals. To ordinary Russian soldiers, unlike their European-educated superiors, the English and the French were utterly foreign and were therefore perceived as occupiers, who should be driven away from Russian land at any cost. Sergeant Timothy Gowing, of the Royal Fusiliers, recalled: "My attention was drawn to one nasty case: a young officer gave a wounded Russian a little brandy out of his flask and was turning to walk away when the fellow shot him mortally." Allied soldiers were not particularly civilised either. Abuse and torture were quite frequent. The French Zouaves (a light infantry regiment), who had had a rough experience fighting barbarians in Algeria, were particularly brutal. A Kaffir servant to Captain Clifford, with blood-chilling matter-of-factness, claimed that he had gotten the biggest pleasure from walking in the battlefield and looking at the bodies of enemy soldiers missing arms and legs, who reminded him of "apples in the garden". He returned from one such walk, his arms full of Russian sabres and helmets, saying: "Capital! So many corpses. Arms and legs everywhere. All of them the master's enemies." The Crimean War was the first major armed conflict to make use of the modern technological invention of the time, the electric telegraph. Thanks to a cable the allies had laid along the bottom of the Black Sea, reports from the battlefield could reach Paris and London on the same day. By the following day, reports from the front appeared in the morning papers. These technological advances gave birth to a new profession, the war correspondent. One of its most prominent representatives was William Howard Russell, writing for The Times. He was embedded with the British Army and became particularly well-known for his critical assessments of the state of the English army. The first war photographer, Roger Fenton, also emerged during the Crimean War. His collection of Crimean photographs was later purchased in its entirety by the United States Library of Congress. The presence of correspondents was a thorn in the side of the allied command. Baron Raglan, for example, was outraged by what he saw as journalists' unpatriotic behaviour when, while his troops were boarding ships in the Bulgarian port of Varna to go to Crimea, all the London newspapers were already discussing the upcoming operation to seize the peninsula. With such helpers, the baron argued, the enemy would not have to spend any efforts on intelligence gathering; all they had to do was open the papers. There were many journalists on the Russian side too. The young Russian writer Leo Tolstoy, serving in besieged Sevastopol, published his cycle of stories in 1855 about the war called "Sevastopol Sketches". The Crimean War has left its mark in the languages of the warring sides, particularly in the vocabulary for clothing. The word balaclava entered the English language and is used still to denote a tight woollen hood with slits for eyes and nose. The term is believed to have been first introduced by British soldiers who, in the winter of 1854-1855, were freezing outside the town of Balaklava in Crimea, not having appropriate winter clothing. Another sartorial term to enter both languages was the Raglan sleeve, named after FitzRoy Somerset, the 1st Baron Raglan, who is believed to have worn a coat with this style of sleeve after he lost his right arm in the Battle of Waterloo. Another item of clothing, a collarless knitted woollen sweater with buttons at the front, began to be called a cardigan after the English general James Brudnell, 7th Earl of Cardigan. He wore a sweater of the same description under the tunic of his uniform in cold weather. The Europeans found the Crimean climate rather cold. According to popular legend, it was the Crimean war that marked the widespread use of cigarettes, as both Russians and the allies borrowed the practice of rolling tobacco into strips of paper from their Turkish comrades. By the end of 1855, all the warring sides began to realise that it was pointless to continue the conflict. Huge losses - in Sevastopol alone, the allies lost about 90,000 soldiers, not counting those who died of disease - set the public in France and England against the war. Russia found itself in a difficult situation too. Talks resulted in the Paris Peace Treaty of March 18, 1856. It was a compromise that all the great powers had to agree to, as the balance of power in Europe after the war remained pretty much the same as before, while the disputes that had provoked the conflict in the first place remained unresolved. Unfortunately, 60 years later, when the First World War began, the very same questions rose again and were once again addressed through military means.